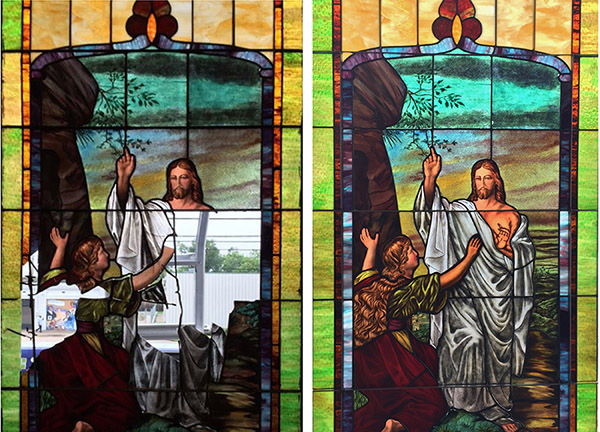 We offer expert church stained glass restoration and repair services to all religious institutions in the Kansas City area, and across the state. 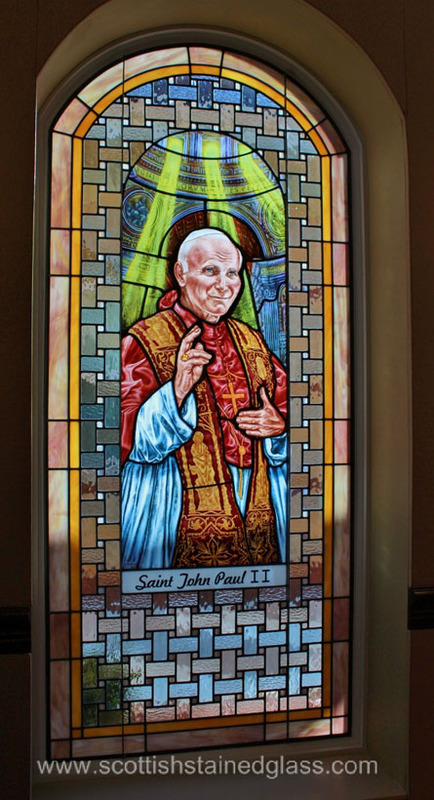 Although stained glass windows are quite durable, and indeed many of them have existed intact in their original locations for a century or more, the fact is that time, the elements, and even gravity itself can take a toll on stained glass. Various factors can cause the need for a church’s stained glass windows to need repair or restoration services. 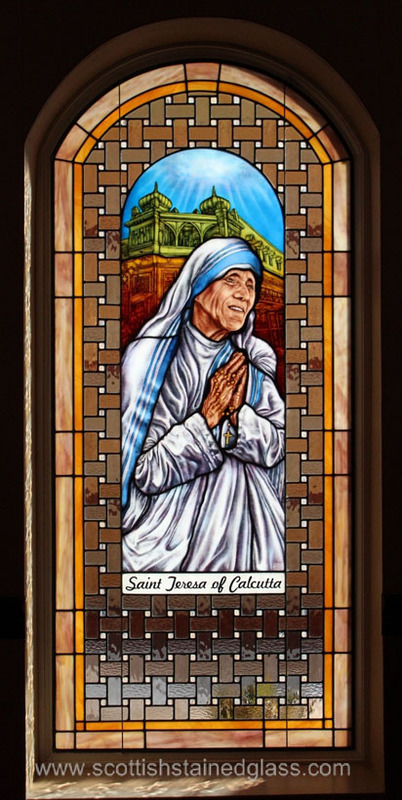 Here at Kansas City Stained Glass, we have a passion for antique stained glass and for preserving the work of the master artists and craftsmen who created it. 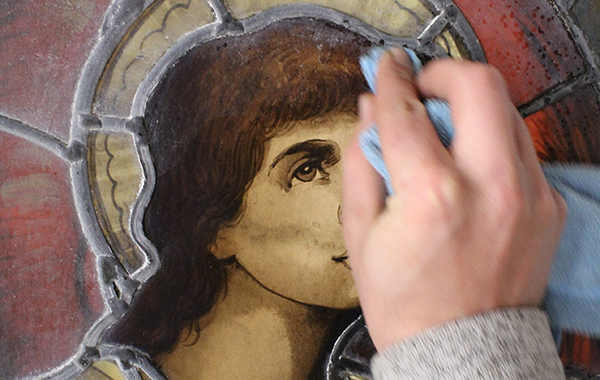 To that end, we are always honored to be asked to restore church stained glass and have developed special restoration techniques to ensure that once restored to its original beauty, the stained glass windows will continue to inspire and enchant for another century or more. Sometimes, church stained glass might have some pieces of glass that are cracked, chipped, or have fallen out entirely. This might be a minor repair job. With this type of church stained glass repair, we would need to bring the window to our studio. At that point, we would work inward from the side of the panel closest to the damaged glass, and disassemble only as much of the window as is absolutely necessary to replace the glass with matching glass. However, there are reasons why a full restoration might be needed. Man Kansas City area churches have large stained glass windows which are quite heavy. The weight, combined with gravity, can cause these windows to sag over time, creating a bowed effect. This structural change puts a tremendous strain on the glass and it might start to crack or have pieces drop right out of the window. Over time and exposure to gravity and the elements, the lead strips that hold the glass pieces together might become damaged as well, becoming brittle, loose, or bent. 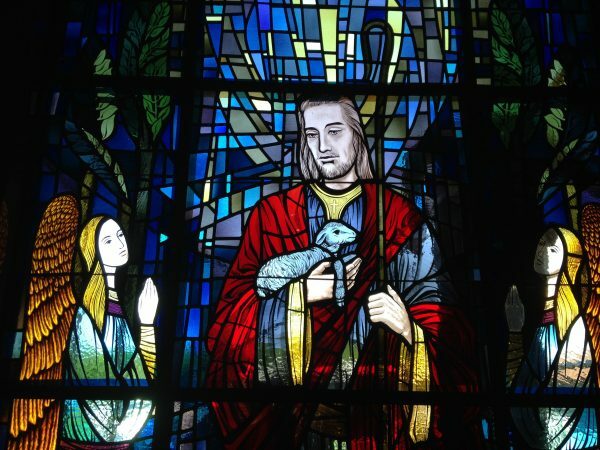 In an attempt to protect their stained glass, some churches actually added a sheet of plexiglass to the outside of the windows. 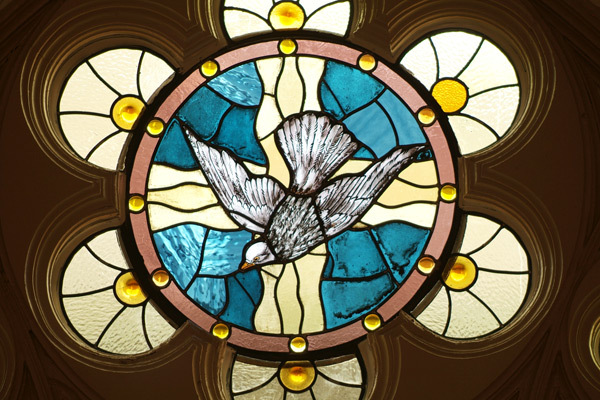 Unfortunately, the plexiglass traps heat between itself and the stained glass, which also contributes to the deterioration of the lead and therefore the structural integrity of the windows. These windows require a full stained glass restoration process. This would involve bringing the windows to our studio, completely disassembling them, thoroughly cleaning the glass, and then reassembly with new glass to replace any damaged glass. For large heavy windows, we would take various steps to ensure that the same problems do not arise. These measures might include reinforcing the new lead internally, for greater strength and durability. (Lead is a heavy yet rather soft metal.) We also use steel supports in the frames, adding two panes of clear glass to protect the exterior of the stained glass windows. Unlike the plexiglass that might have been there before, these two panes of glass actually increase the thermal efficiency of the windows overall. With church stained glass restoration process, the newly restored windows will continue to inspire worshipers for many generations to come. 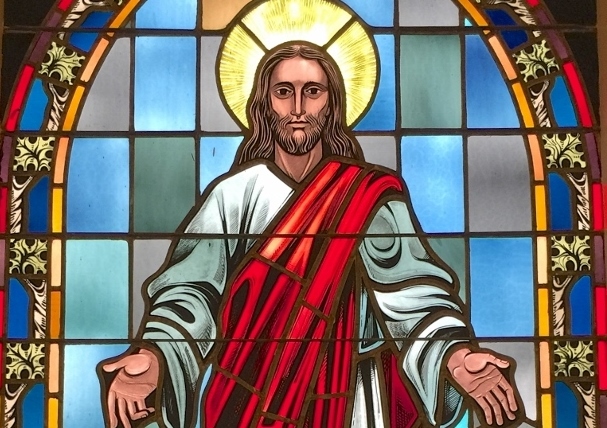 For more information about church stained glass repair or restoration, please contact us today. Church stained glass restoration can be expensive. Please feel free to ask us how we can help with a fundraising drive for the costs of the restoration.